I spent a morning kayaking in Sebastian Inlet Florida State Park, and it taught me a bit about motherhood, about being a caregiver, and about surviving my “sandwich generation” moments. Stick with me here guys. Life happens. It just keeps on happening. Kids. Aging parents. Health issues. STRESS. Non-stop worry and stress. I feel like my life has devolved into some sort of gauntlet. I know I’m not alone here. I’m pretty sure there are plenty other folks out there who feel like they are managing to just get through this one day, and then onto the next, and the next. Last week I did something a little crazy – I jumped on a plane and went to Melbourne, Orlando (you can fly direct with Porter from Windsor, Toronto or Ottawa starting Dec. 16th. Woot.) for a whirlwind 26-hour press trip. And then I did something a little crazier still. Something which for me was totally outside of my comfort zone — I went kayaking. Yep, that’s me in a kayak. My friend Aeryn from Geek With Style snapped this photo (as well as all the other photos in this post). It was my first time in a kayak. I was a total newb. A little awkward. A little scared. A little in awe of the wildlife and the tide. 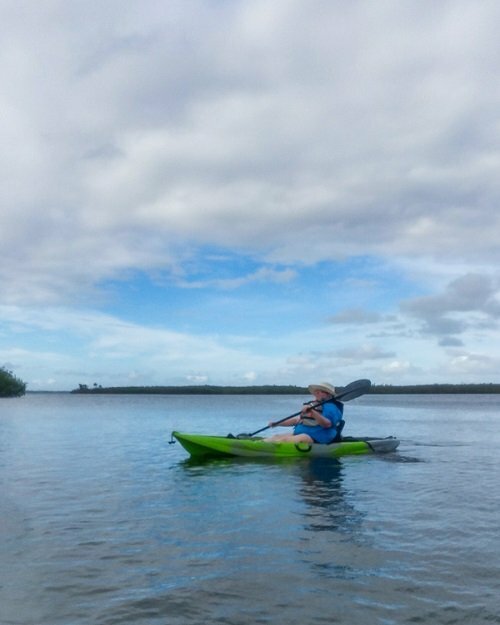 And something magical happened, while I was out there in the salt water and the sun, paddling along the secluded mangrove-fringed shoreline of Sebastian Inlet’s Indian River Lagoon, I was so focused in the moment that I forgot about ALL OF THE THINGS. 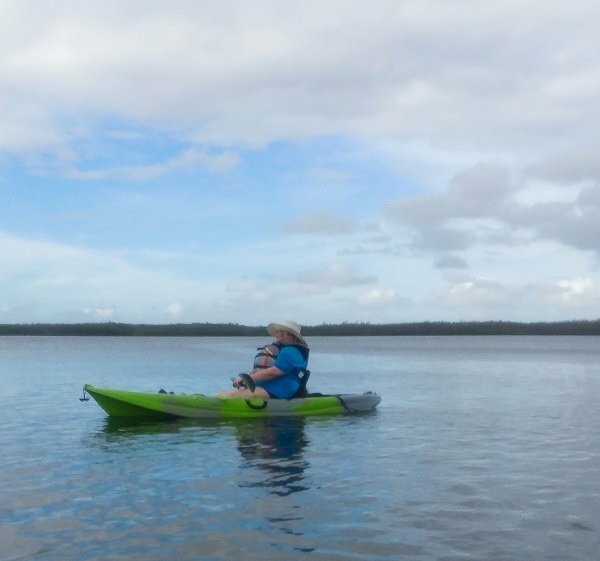 Later, on the plane ride home, thinking back on the experience it occurred to me that there are actually quite a few parallels between being a caregiver and paddling a kayak. I am an out of shape, overweight, forty-something-year-old who’s never been kayaking before. About halfway through our trip around the lagoon, I started to feel pretty spent. I probably should have turned around at that point. I considered it. But instead, I stubbornly kept going and bit off a bit more than I could chew. At home I find myself doing this too. Taking on too much. Trying to do ALL THE THINGS. Saying yes when I probably should say no. Saying, “I can do that.” when I probably should be asking for help. You have a finite amount of energy and time. Know your limits. Stop and consider; How long will this take me? Can I really fit it into our schedule? Is this something I can delegate to someone else? Will I be able to make it all the way out to the edge of the lagoon, or should I save my energy for the return trip? If you feel like you are being blown away, ask for help. That morning, out there kayaking in Sebastian Inlet Florida State Park, I was feeling a bit sore and worn out by the time I started to make the return trip. I veered off a bit to the right. There was a good bit of space between me and the rest of the group — no big deal right? But then the wind picked up just as I slipped into a strong current, and it took me paddling as hard as I could to just one side of the boat merely to stay in place. I was barely moving. I was creeping forward half an inch at a time. I couldn’t stop paddling for even a second, or I would be pushed off further away from the group. It was four minutes that felt like forty. Did anyone notice I was struggling out here? I was scared of flipping over. I was scared of being blown off towards the wrong bit of shore. One of the guides made a quick beeline for me. My friend Aeryn (the brilliant brain behind Geek Life) was close behind. I made it across the open windy space and to the edge of the mangroves just as they arrived. I had made it across on my own. Still, just knowing that someone was heading towards me, just knowing that they saw that I was struggling, it was an immense relief. Part of me was embarrassed to have blown the whistle, but I was far more relieved than embarrassed. I don’t know about you, but I think I need to blow the whistle a little more often in my everyday life. When you are struggling, when you feel like you are being blown off course, ASK FOR HELP. Caregiver burnout is a thing. Look for resources within your family or within your larger community and ask for help. Sometimes you just need to travel alongside someone who is on the same journey as you. One of the kayak instructors came up and paddled along near me. My friend Aeryn came up along the other side. We chatted as we paddled our way back to the dock. Having someone else close by, taking the same path, was comforting and inspiring. It gave me the confidence I needed to get safely back to shore. Connecting with other people, virtually or in real life, can be a lifesaver. Talk to other moms or other caregivers. Network with people who are on the same journey as you are. Paddle with the rhythm, not against it. And isn’t that some darn good advice for the day to day? My life has changed so much over the past few years, and sometimes I find myself fighting against the current. Trying to act like things are the way they once were, when they most emphatically are not. My advice to you (and myself!) — Embrace change. This is life now. Go with it. Look around, at your environment, your family, find the rhythm and work with it, instead of fighting against it. While I freely admit that I probably took on a bit more than I should have during my kayak adventure, I was happy to make it back to the docks on my own — without even flipping over. I was exhausted and proud. Woot. Fist bump. If I hadn’t tried I would have lost out on giving myself the chance to discover that I could do it. Sometimes you simply don’t know what you can do until you try. Sit at the hospital all day watching over a loved one? Wake up early to get the kids out the door? Stay up late to get things done? Move heavy furniture? Clear out a dusty attic? Deal with cancer? Take care of your ageing mum? Tackle life with Alzheimer’s? Advocate for your special needs kid? Advocate for your sick mother-in-law? You speak up. You champion for them. You do it. You get it done. You do whatever needs to be done, right? Sometimes we have a choice and we take a chance. Sometimes we’re just dumped into the ocean and we have to swim. Either way, a life jacket is never a bad idea. What is your life jacket? What keeps you afloat? Try new things. Push your limits. Do something difficult, something that forces you to focus in the now. For me kayaking was difficult and new, challenging and just a tiny bit scary — and it took me outside of myself, snapped me right out of my brooding, and forced me into the moment, into the now. For one glorious morning, I forgot all of my stress and worries. All that day to day garbage was completely dumped from my mind, as if it never happened. There were dolphins playing in the water a stone’s throw away from me, pelicans and heron perched along the shoreline, fish jumping up into the sunshine and splashing back into the water just ahead of my prow. I’m usually all about appreciating nature, but in this case, the truth is I was too busy making sure I wasn’t banging into or capsizing anyone else to appreciate the wildlife around me. But there were small zen moments. Let the paddle rest across my lap, take a few deep breathes before the wind or the current started to push me this way or that. Find the calm centre in the chaos. I see you. I know how you want to laugh bitterly when I tell you that you have to “make time for yourself”. But seriously. It’s important. Feel it. Take a deep breath. Ocean air. Tangy mangroves. Or peanut butter and sticky toddler kisses. Whatever your moment is, embrace it, and find the beauty in it. Those are Aeyn’s tootsies. She’s got that calm zen thing down pat. Connect with nature. Read a book. Take a nap. Play a board game. Make it a priority. Find the tiny bits of space that allow you to do the things that recharge you. Do whatever you need to do to put aside ALL OF THE THINGS, even just for one small moment. 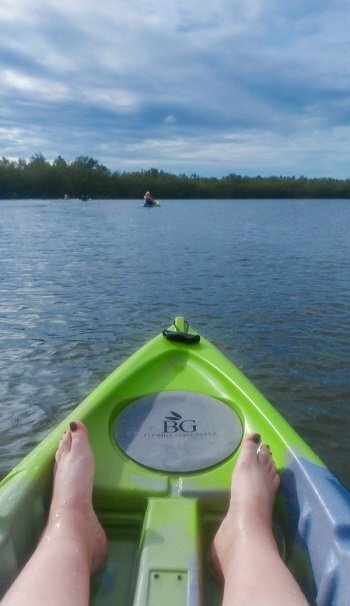 And if you are ever offered the chance to go kayaking with the dolphins and the manatees, take it. 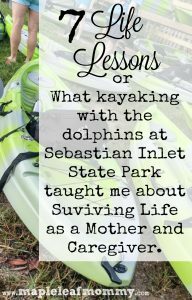 Disclosure: Thank you to Porter Airlines and Melbourne International Airport for the chance to travel to Melbourne Florida and experience, among other things, kayaking at Sebastian Inlet State Park. As always my words and opinions are my own. I really love all the insightful ways you compared our paddling trials to everyday life. You ROCK my friend! It is always good to get out of our comfort zones. Looks like a fabulous time. It was a pretty amazing experience. I didn’t see manatee, but other people did. And there were dolphins. So cool. I’m so proud of you. I have to say, at one point the guide (that I was tandem kayaking with) said: “I don’t like the look of that.” We then paddled madly in your direction. I know she was concerned about tipping. Two things I learned: Don’t be afraid to ask for help or guidance and the weather on water changes in an instant. That is what I learned from our trip. Thanks, Margarita. Finding out after the fact that the guide looked over at me struggling and said “I don’t like the look of that” makes me goo “eeep” just a bit. LOL. . I love that you went tandem with a guide. I somehow missed the fact that tandem was an option, until after I was already out in the water or I totally would have done that. Though in the end, I’m glad I stuck it out solo. I think “don’t be afraid to ask for help” is seriously my main take away from that experience. Some really great advice here Deanna. Sounds like an exciting day out on the water, full of ups and downs like life. Thanks for your information. I do like kayaking but still consider myself a novice. I think kayaking is something I’d definitely like to try again, when given the chance. I love this post and how you related the adventure to your life. You shared some important life lessons that each of us need to learn and implement. I seriously do need to implement some of this in my day to day life. Insight is one thing, implementation is another. Thanks for the kind words, Linda. I do think I need to conk myself over the head with a few of these lessons, possibly repeatedly. This is a great post and your advice is excellent especially Try new things Push your limits.because you never know what you’re capable of, until you try something new. Beautiful post! It’s a tough time being sandwiched but it will get better Deanna. I love the lessons you got from this experience. I heard many of the people who went on the kayaking experience indicate it got choppy and challenging and the weather was definitely not ideal. But you got through it. I still remember you innPuerto Vallarta snorkelling with jellyfish. That was brave as well. I think you have a lot of brave moments. And yes Aeryn is the best! The beautiful thing about friends like her is they recognize when you need the help and do it quietly often without needing to be asked. That is gold. Always push your boundaries and experience those things which scare you a little bit. You grow. Great post! 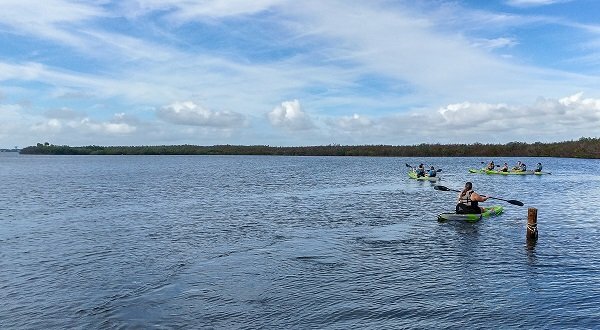 I love how this kayaking trip taught you so much, and thank you for sharing! It’s been so long since I have been able to really experience something new and to get out of my comfort zone like you did, but I am so inspired! I love that you got out there! Kayaking is great and it’s nice to explore like that. Wow! Feeling just a wee bit jealy here.I have always wanted to go kayaking like that for a day.That was awesome! I am so glad you had some fun doing that. I agree– we all need to step out of our comfort zone & let ourselves experience new & wonderous things that change us for the better! What an amazing experience! Looks like so much fun! Wow! Glad you had such a memorable experience. I’d love to try kayaking one day but I think when I do, I’ll have to use your tip and have someone along side me. I’m not the best in open water! This is a really wonderful blog post. I like canoeing, but have to admit I’m a bit afraid of kayaking. And I also feel that I’m at a point in my life right now where I need to ask for help, as it’s all been a little too much for me lately.